HOA Rules: Where Can You Park Your Truck in Austin TX? You are here: Home / Texas Real Estate Reports and Local Interest Articles / HOA Rules: Where Can You Park Your Truck in Austin TX? You love your truck, your boat, your RV, or maybe the airstream trailer you use for selling food down on South Congress. Your HOA might have a different view of those vehicles and where you can, or can’t park them. HOAs (Home Owner’s Associations) can restrict what you do with your own property, including what you can do with stuff you own. Stuff like the truck you drive to work every day, or the one you use to haul your RV to camp grounds on the weekends. Towns and cities like Austin have zoning regulations that describe the approved uses of a property. For example, zoning regulations specify which land can be used for single-family homes, for public works (schools, libraries) and which land can be used for commercial purposes. HOAs for individual subdivisions can further restrict the use of the property within a subdivision, and many do. 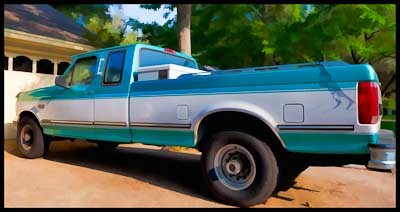 Our home owners association hates my truck, the one I love so much that I turned it into digital art for this article. They say it is too big (it isn’t), they say it isn’t registered (it is), they say I need to park it in the garage (I don’t). We go a round or two on this every few years. Bottom line: they just don’t like an old truck in a neighborhood full of nice new cars. It looks like a work truck (it is) and I’ve only seen one other like it anywhere near where we live in NW Austin. So although I am annoyed that my truck is frequently targeted for attention, I also know that the reason why my neighborhood is so nice and clean and neat is because the HOA really keeps on the homeowners about keeping up with property maintenance and things that might otherwise lead to a trashier-looking neighborhood. Sometimes, however, I wish I lived somewhere where I could have an ATV track in the backyard, a huge out building for working on old cars and a great big chicken coop or a little barn for some goats. Oh, and someplace to park a trailer to haul behind the big green truck for our weekend tours around Texas. If you live here, you know that Austin has a very diverse set of neighborhoods. Old, new, big lots, small lots, small homes, gigantic homes. Some neighborhoods, like mine, are very restrictive and some aren’t. Some have home owners associations that don’t enforce the HOA rules, and others are completely gung-ho about enforcing every line-item of the restrictions. If you already own a home in Austin, did you know for sure what the HOA restrictions were for the neighborhood before you bought your home? Did you read that piece of paper in the giant pile of paperwork you received during your home buying process? Did your real estate agent go over it with you? Have you had any trouble keeping your property in-line with the rules? If you’re looking to buy – is HOA-free living something you need? Do you need to park a big, ugly vehicle in your side-yard so you don’t have to go haul it in from out of town when you need to use it? It might be a nuisance to have to think about it when you just want to buy that cute home NOW, but it’s a much bigger nuisance to discover a restrictions you don’t want to live with later on. One last thought – green living trends are encouraging city dwellers to do things that may run afoul of many HOA rules. Things like hanging laundry on a backyard clothes line to dry, replacing water-hogging grass with drought-tolerant plantings or crushed stone, or raising chickens for fresh eggs instead of buying ones that have been hauled half-way across the state to the grocery store. All are forbidden in my neighborhood, and all are on my list of things I really want to do. The HOA rules may force us out of the suburbs and up into Leander or Liberty Hill, to get back a little of the freedom we signed away when we bought our current home. So tell me, what do you think about HOA rules – love ’em? Hate ’em? Love some and hate others? Do you see any trends towards greener living in your area that are bucking some of the rules? I’d love to hear what you think – good, bad or ugly!